Tags are another way to identify how people connect to your organization. Arena offers four distinct tag types and each type is designed for specific functionality. •Personal Tags are only accessible to the current user and allow each user to track people such as lunch contacts, personal accountability partners, and relationships specific to you. •Ministry Tags allow you to track people and their relationship to your organization’s ministries, such as, Bible study participants, organization committees, and other ministry-specific groups. •Serving Tags allow you to track volunteers and prospective volunteers for your organization’s ministries. You can also track volunteer qualifications and/or training. •Event Tags allow you to track organization-wide and ministry-specific events and classes, where online registration is available. •You can create and organize tags in a hierarchy for logical groupings. •Every level in the tag hierarchy can have individuals connected if desired. 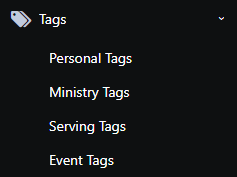 •You can easily move tags from one level to another or from one type to another, with the exception of moving Personal, Serving or Ministry Tags to Event Tags. •Add Tags to individual records or add records to Tags. •Each record in the tag has Date fields to track dates such as date the record was added to the tag and the date the record was dormant. •You can add Tag Activity Notes for each record in the tag. •Add a record to a specific tag one time. •Each tag can be secured. •Users can select or omit the tag in Arena Lists. •Send email or Text Message (SMS) communication. •View and print a Roster. •Identify the person’s status - Connected, Inactive, Pending. Serving Tags have other default statuses and provide the opportunity to customize to fit your organization. Each tag four levels of security permissions. •View gives users permission to view the specified tag(s). •Edit gives users permission to edit the specified tag details. •Edit Security gives users permission to edit security for the specific tag(s) and cascade permissions to child tags. •Edit People gives users permission to edit people in the specified tag(s). Event Tags have two additional permissions to "edit registrations" and "allow refunds". After you have determined how you want to use Tags, it is important to understand Tag Security. Ministry, Serving, and Event tags are commonly organized so that security is set on a Parent tag (one for each department) and then each child tag inherits the security from the Parent tag. Or, security can be setup individually on each tag. Evaluate Profile Details and Profile Tab Control modules on the Profile Member Details page, and the Profile Activity and Tag Member Activity modules on the Tag Member page. Customize as needed.